When planes were small and buildings expected to be large, putting an airport right in the centre of a city was seen as a very sensible idea. 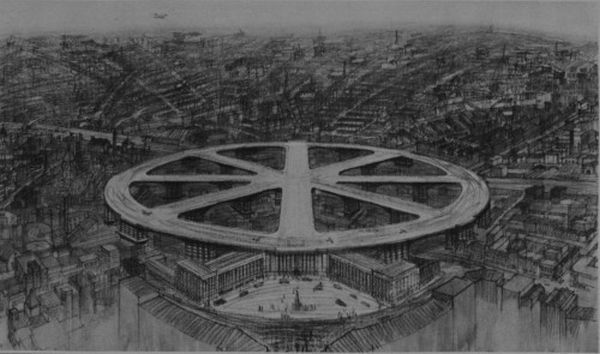 And thus it was that in 1931, an architect showed off one of the most famous of architectural “bonkers ideas”, an airport at King’s Cross. Passenger aircraft were small and expected to remain so, while buildings were thought to be likely to become massive. In fact so massive, that planes could land on top of them. In fact, it wasn’t as daftt as it seems now, an idea that evolved from less sensible proposals, mostly from the USA, for gigantic skyscrapers with runways on top. The architect in question was Charles Glover, and as he wrote in 1931, that the newish airport at Croydon was inconveniently located for most Londoners, and with the growth of private flying, a central London runway was now needed. Business Travel News wonders what Boris would make of it?